2016 Recipient Benjamin August Linder, M.D. The David E. Bates, MD Memorial Award was established through memorial contributions from numerous donors in his memory. Awarded annually to one individual completing his or her residency at North Colorado Family Medicine, the recipient is selected by the North Colorado Family Medicine Selection Committee. 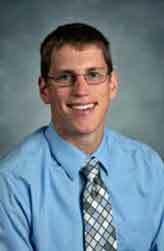 The 2016 recipient of this $1,500 award is Benjamin August Linder, MD.